The last Ecological Reserves (ER) added to the ER system was done in 2004. Since then, over the last decade several Ecological Reserves have been removed from BC Parks with management transferred to other agencies. In one case the area remained as a BC Park and in another the area is now managed as a Municipal Park. When viewed in total, the cumulative impacts of management changes mean a three percent reduction in area of terrestrial ERs and a one percent reduction in the foreshore area of ERs. In terms of hectares there are 3,214 fewer hectares of terrestrial habitat and 25 fewer hectares of foreshore habitat in the BC ER network today when compared to a decade ago. The former ERs are shown on the Ecological Reserves map as are their new management agencies. The biggest reduction in the size of the British Columbia’s ER system occurred in 2006. This reduction occurred with the changes in the boundaries of the Gladys Lake Ecological Reserve, BC’s largest ER, which was reduced by six percent. Friends of Ecological Reserves supported the reduction of that reserve and made two visits to the Spatsizi to review the boundary changes with BC Parks’ Staff Janice Joseph, Larry Boudreau, Len Vander Star and the local guide outfitter Reg Collingwood. FER also received, at that time, support to add a new ER to the system. This support came from BC Parks and the local guide outfitter. The idea was to create a new ER to protect a low elevation mineral lick associated with ungulates using Gladys Lake ER. The proposed ER was to be called Fort Graham and was approximately 10 ha in size. It was never established. (See Autumn 2007 and Spring 2008 LOG articles on this process. There have been other reductions in numbers and area managed as ERs, principally through land transfer of Ecological Reserves to the Federal government as part Gwaii Haanas and Gulf Islands National Parks. Although FER is pleased that transferred ERs remain in protected status, it remains unclear if Parks Canada treat management of these former ERs in a consistent manner equivalent to their original provincial ER designation. FER has requested a commitment to equivalency from National Parks but has received no response. 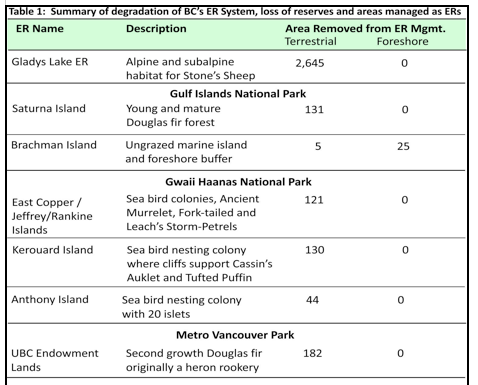 Friends of Ecological Reserves assumes that without explicit ER equivalency and no firm commitment from Parks Canada, transferred ERs are in a very real sense lost as the ecological benchmarks they were originally established to be. We have received no reassurance that they are being managed consistently with their original purpose, which was to provide research/monitoring and education opportunities. Table 1 shows the full extent of the degradation of the ER system over the last decade including the hectares involved in the proposed new South Okanagan-Similkameen National Park.